Former jockey Darren Egan has been banned from racing for 12 years after being found guilty of corruption charges in November of last year. The 24-year-old was found to have deliberately lost races at Chepstow and Bath in July 2013. The British Horseracing Authority said he was involved in "a conspiracy which struck at the heart of the sport". Philip Langford, described by the BHA as the "instigator of the conspiracy", was given an exclusion order. As Langford was unlicensed and not subject to the rules of racing, the BHA's disciplinary panel said that punishment was its only option. It said the exclusion order would be for an indefinite period, and that no appeal should be heard for at least 15 years. 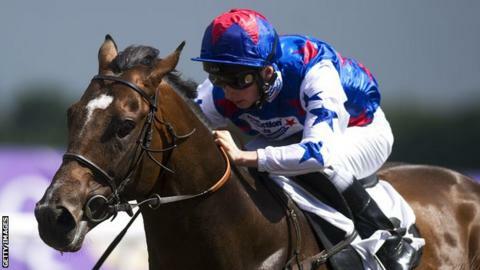 Langford laid bets against Egan's rides between 17 June and 16 July in 2013, making a reported profit of £53,560 from stakes totalling £838,870. The BHA said it was only alerted to the conspiracy by reports of unusual betting patterns. It added Egan accepted wrongdoing in an email he sent to the body in November, explaining he had "needed the money desperately". Egan, a former leading apprentice who has not raced in Britain since October 2013, will be suspended until 22 November 2027.